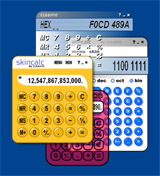 SkinCalc is a free skinnable calculator with more than 100 different skins available for download. Skins make it possible to change the layout and functionality of the software. SkinCalc is brought to you by the folks at Cloanto, who also enjoy doing some artistic work and being part of a creative community. Our human (?) egos like to show off excellence in software design, which is not always easily recognized, especially when applied to back-end servers. But even this part of the world turns upside down sometimes, and we succumb to the orders of some very fine skin artist (or very demanding user). 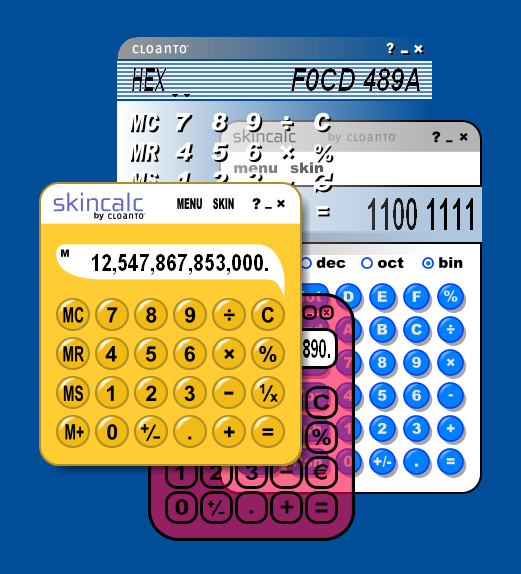 So SkinCalc is a way for us to have some fun on the more popular side of software, interacting with a public of free-spirited friends and making bold claims like "first skinnable calculator" and "first skinnable application with translucency effects" (not sure? check the logs). The SkinCalc software and skins (for which we all have to thank the respective authors) are completely free to download. We hope that you enjoy them, and please feel free to let us know if you wish to provide any type of feedback. If you are interested in custom calculator packages (for redistribution or internal deployment), such software and services are available from Cloanto. The calculators can be currency-enabled, fetching daily exchange rates from Currency Server. WorldCalc and Euro Calculator are examples of such calculators.